There is something to be said for comfort, for knowing what to expect, for things going as planned, and walking a well travelled road. It’s attached to a sense that all is right with the world. There’s an ease and a trust that comes with ‘knowing’ what’s ahead, in front of us, around the next corner. But there’s a problem with this comfortable feeling and that is that it is, well, comfortable. Life is easy, predictable, almost like sleepwalking. We become complacent, we walk our path without consideration, we unconsciously make our decisions. We simply go through the motions: we know the grocery aisles, what things cost, what time the movie starts, where to catch the bus, who we are going to meet, what to wear, what to expect along the way. We feel safe with what we know and understand, we fear what we do not. Ask yourself how you would feel if you were not so sure footed, certain of your immediate future, able to anticipate the next move. What if you shook things up a bit, lived on the edge of uncertainty for just a while? Maybe what we all need is to feel slightly on edge, not quite knowing it all. Maybe we need a little of the unexpected, unpredictable, perhaps a challenge or two. We could move out of our comfort zone, be inquisitive again, attempt to adapt, perhaps change things up, maybe see things for the first time. Would we find it refreshing or frightening if life were somewhat difficult, to have to figure something out, to challenge ourselves, to think beyond the box, to colour outside the lines – to walk a road less traveled. When was the last time you did something for the first time, nervous, not scared, but concerned and curious about what was ahead? 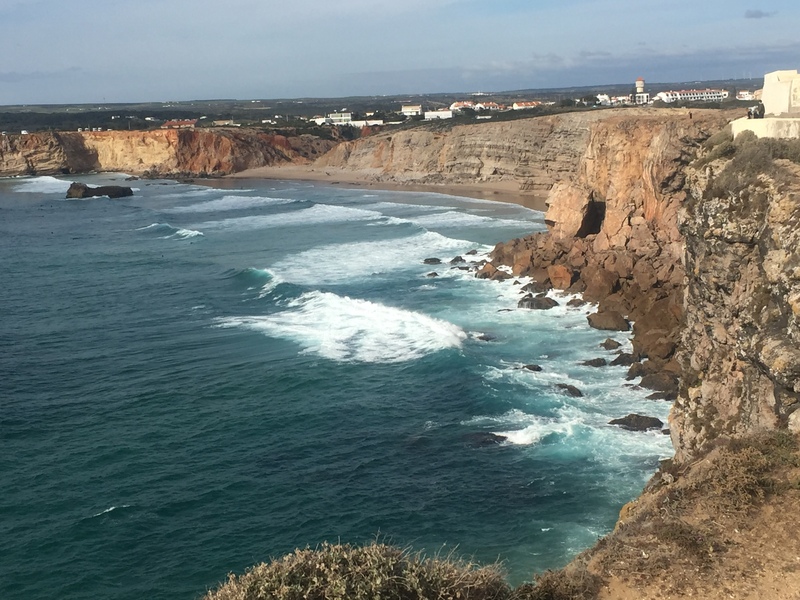 For me it was the first three months of 2016 when I went to spend a few months in southern Portugal. I rented an apartment in a small town where the language was different, where I didn’t know my way around, where the food was not the same, where the signs were harder to read. It wasn’t completely foreign though, just enough to add a little more excitement to my day. I have some family in the area, so I had help if needed. I had been to this town before so I had a sense of where I was coming to. I had time on my side, so I wasn’t rushed, and I didn’t have to know it all right away. I took my time, asked questions, got curious and tried new experiences and some different foods, met some new people, and walked streets I hadn’t walked before. It was wonderful. I used my brain to figure out the currency and learned new words so I could get on the right bus, follow the rules at the swimming pool, take the correct route to the store. I went to places I wasn’t familiar with and figured out how to do things that were not necessarily easy for me. I cooked with new and sometimes unusual ingredients. I made do without some of the known things from home. I found ways to be creative, to fix things, to simplify, to make do with what I had. And in the process I discovered some things about myself. I am able, and resourceful. I am smart and open and adaptable. I am interested and intent. What new situations do for us is heighten our senses, expand our frame of reference, and enlarge our scope. You become more conscious, you have to, in order to survive or at least to get on with things. You listen more intently, because you need to hear what’s being said. You need the directions in order to find your way, you need to know what is allowed and not permitted. You need to hear what’s going on, so you can be part of it, perhaps even make a contribution. Your sense of smell heightens, there are unknown scents, some that draw you in, some you know you won’t miss, but your nose knows, this is something new. You see with eyes wide open, you need to watch your step, find your way. What you are passing by is new to you, so in order to see it, you have to look up and look ahead. You are no longer just going through the motions, because there is no motion yet, you are not yet used to anything, nothing is the same old thing, it’s the new thing, and it deserves and demands your attention. Your mind works harder, trying to process it all, to make sense of it all, and to see what fits, and how. While there is something to be said for the comfort of the status quo, perhaps many of us would benefit from an opportunity to turn down a different path, take in a new experience, alter our patterns and spend some time in the unknown. The result could be exhilarating, and it might just lead to a more conscious place: more awake, more aware, more alive.